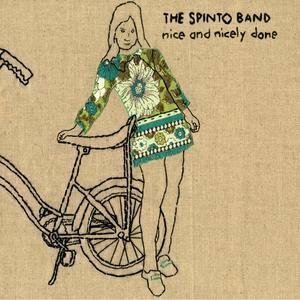 Props to Shiv and Mike over at WOXY.com for turning me onto the Spinto Band. Actually, let’s talk about WOXY.com before we get back to the music—after battling the economic realities of internet radio for a couple years, WOXY.com is turning to its listeners for support. Their goal is 7,000 members to keep the music streaming. If you’re already a listener, subscribe. If not, start listening and if you like what you hear, subscribe. Sure the internet puts power in the hands of the people, but those hands gotta be generous and help foot the bandwidth bill. Back to the Spinto Band—they’re a bunch of East Coast boys with ties to the Mississippi delta and who like a little rhythm to their pop. “Crack the Whip” is a close runner up to what I consider the most danceable pop track from last year, Of Montreal’s “Wraith Pinned to the Mist (and other games).” And since Beulah called it quits, the Spinto Band make for a respectable replacement in the post-Elephant 6 world. Keep your eyes and ears peeled for an upcoming tour with Arctic Monkeys and a new album for Bar-None in the near future. Oh, and more props to *Sixeyes for unearthing the MP3s. this is one of my favorite bands from the moment. highly recommended!!! Thanks for plugging woxy. It is an incredible source for indie/alternative bands. Please do what you can to support. The Spinto Band is a great choice! Yeah, *sixeyes picked me up to these guys. Definitely great music. about time they made it on 3hive. known these boys since grade school. rock on. ties to the mississippi delta? an entry with the spinto band and woxy? it doesn't get better than that. Thanks for the WOXY plug! And for the Spinto! thanks for the link to this band. i have been hearing great things about them. also a thanks for all the work done here at 3hive. you've opened my eyes to a lot of great bands that i wouldn't have heard of otherwise! thanks! you're welcome. They're a great band. As for ties to the Delta, the late Ray Spinto lived in the Delta and the songs he had written were the creative impetus which formed the Spinto Band (making a long story short).